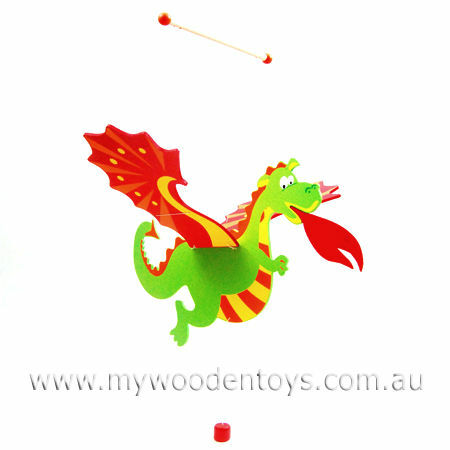 Wooden Flying Dragon Mobile is a fantastic creation with beautiful red out stretched wings and felt fire blowing from its mouth. This dragon is hung and weighted in such a way that when you pull down on the string attached to its belly it moves up and down and flaps its wings. Dragon mobile is sure to be a big favorite and a lovely distraction over a change table. Size: Wings are 55cm across. Mobile hangs 60cm top to bottom. We like this because: "Lovely hypnotic flight."